The Mellon Creative Arts Across Disciplines initiative, Ralph E. Ogden Foundation, and Frances Lehman Loeb Art Center welcome Mark Dion, who will present a talk, “Trouble shooting and trouble making—worldwide.” Dion is a New York and Pennsylvania-based visual artist known for his “cabinets of curiosities” that incorporate found objects into site-specific installations. He will be a Vassar artist-in-residence, Spring 2016. 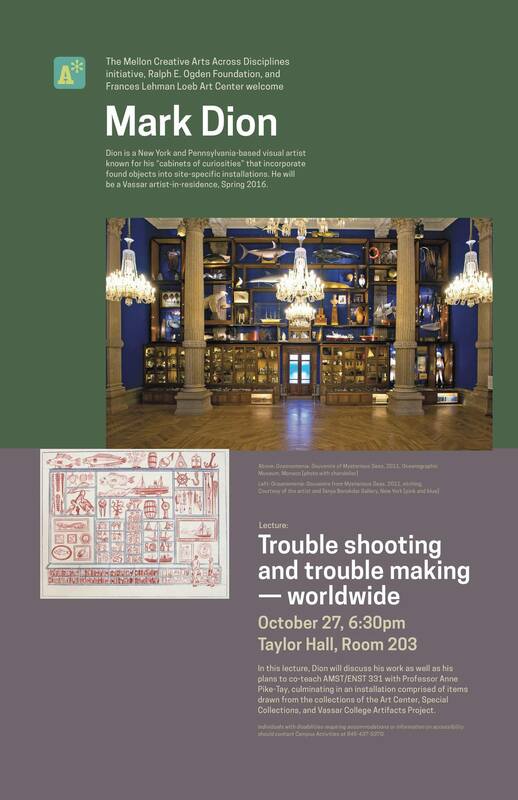 In this lecture, Dion will discuss his work as well as his plans to co-teach AMST/ENST 331 with Professor Anne Pike-Tay, culminating in an installation comprised of items drawn from the collections of the Art Center, Special Collections, and Vassar College Artifacts Project.